A few weeks ago I did an article supporting publishers on having day one DLC for games. For those that missed it you can find it here. When I wrote the article the I mentioned how publishers had been doing day one DLC did not really bother me. The day one DLC was included with new purchases of games. You only had to buy it if you purchased the game used. My rational was they were supporting their customers on the rational that you are not their customer if you buy it used as they get no profits from a used game, and only become a customer if you buy the new game or the DLC. It seemed like a good argument when I wrote the initial article. Then EA / Bioware goes and f*&ks it up. Not a screen cap from the DLC, I just liked Legion. 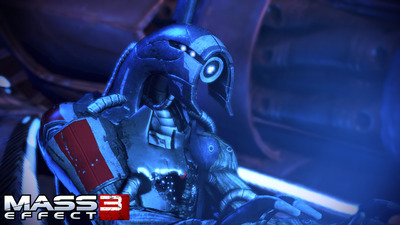 With the release of Mass Effect 3 they are going to have the day one DLC From Ashes. This DLC does come with the game, but only the collectors edition or digital deluxe versions of the game (which was not announced until this month). If you happen to only purchase the normal version of the game then you have to shell out the $10.00 for the DLC should you want to play it. Now it feels like they are sticking it to their existing customer base with this. The DLC is not content they started working on after launch to add to the life of the game; it is not a bonus for buying a new copy over a used one, it just seems like a money grab. Don't get me wrong, I am a sucker and will be getting the DLC. I even canceled my normal version pre-order at Gamestop and placed an order for the digital deluxe version on Origin (since now it would only be a $10.00 difference between standard and digital deluxe). But I still feel like I am getting slighted by the publisher on this one. (Ok, this was more of a rant then normal articles are, but I wanted this off my chest).